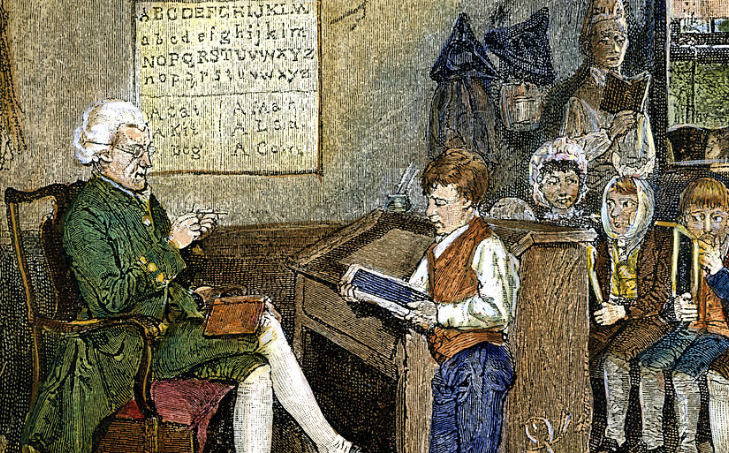 Colonial scene: A schoolmaster and his pupils in the early days of the American republic. When critics complain, especially now that the 2016 presidential campaign is starting to take shape, that the federal government should stay out of public education, or that it has no business there, it would make sense for them to turn to George Thomas (pictured, left) for some helpful historical perspective. Why? Because Thomas, a professor of government who specializes in American constitutional development, might surprise them with the following information about the relationship of the federal government to public education: The Founders very much believed that the federal government should play a part in educating the American public. In fact, they considered it vital to this country's survival. Education is "not formally mentioned or even acknowledged in the Constitution," writes Thomas in The Founders and the Idea of a National University: Constituting the American Mind (Cambridge University Press), and this omission may suggest to some, especially opponents of federal influence, that "it was left to families, local communities and the states." But, Thomas adds, "national education was not only contemplated by the founding generation, it was understood as part of creating and maintaining the American constitutional order." Thomas' new book explores this preoccupation with establishing a national university -- he calls it an "unrealized dream" -- in the writings and thought of Washington, Franklin, Jefferson, Madison, Webster and many other members of the generations that envisioned and cultivated the American experiment in democracy. Such a university, he explains in his book, goes hand in hand with the machinery of a democratic government. To extend that metaphor further, such an educational institution also provides the necessary oil to keep that machinery running smoothly. In 1796, George Washington emphasized the importance of establishing a national university during one of his last public appearances as president. Washington, Thomas tells us, noted the "delicate and crucial link between education and republican government." "...a primary object of such a National Institution should be, the education of our Youth in the science of Government. In a Republic, what species of knowledge can be equally important? And what duty, more pressing on its Legislature, than to patronize a plan for communicating it to those, who are to be the future guardians of the liberties of the Country?" Washington's point underscores the subtitle of Thomas' book as well as the reason why such an institution was envisioned. The American public needed (and still needs) help in understanding and appreciating why this country remains, nearly 240 years after its founding, unique in its constitutional identity. In an advance book review, constitutional scholar Gary Jacobsohn salutes Thomas' scholarship for illuminating an overlooked aspect of the relationship between the Constitution and the American people. "The Founders and the Idea of a National University is a superbly illuminating study of an unrealized component of constitutional design that through [Thomas'] efforts may yet contribute to the sustaining of the American political order," says Jacobsohn, who is Malcolm MacDonald Professor of Constitutional and Comparative Law at the University of Texas at Austin. A story of "the American present"
Although The Founders and the Idea of a National University looks back at the American republic's early formation and then traces its evolution regarding this idea, Thomas' book pivots to help us understand current climates of debate over government and education issues -- whether they're taking place in presidential campaign circles or in higher education. "[T]his is really a story about the American present," Thomas says about his new book in a blog post for the Jack Miller Center. "What role do America's colleges and universities play in cultivating a civic mindset? For all the talk of leadership at elite colleges and universities these days, do they promote the sort of publicly spirited leadership beneficial to maintaining America's political order?" A first place to look for answers and clarification is Thomas' book, which serves as both an important act of historical preservation and as a reminder of an idea that has proven itself to be timely as well as timeless.